After a year in which the Chinese company has obtained a great recognition worldwide, thanks to a very active advertising policy on the internet, which includes great offers and discounts. In this sense, the update to Android 7.0 Nougat in the Vernee Mars can be understood as a further step to win the favor of users; not only that, but also be the first smartphone with the powerful Mediatek Helio P10 processor to receive the new version of Google's operating system. The news comes directly from the official Facebook page of the company, where added the image that we show here as evidence (and confirms the update for tomorrow). In the current landscape of Android devices, many users are looking forward to improving the user experience and inclusion of improved software through the updrate to the final version of Google's operating system, and so the news that the Vernee brand is ready to give one of its existing models all the features included in Android 7.0. The deployment of this firmware version in the Vernee Mars inevitably makes us think about future updates of the operating system on other models such as Vernee Apollo Lite and Vernee Thor. 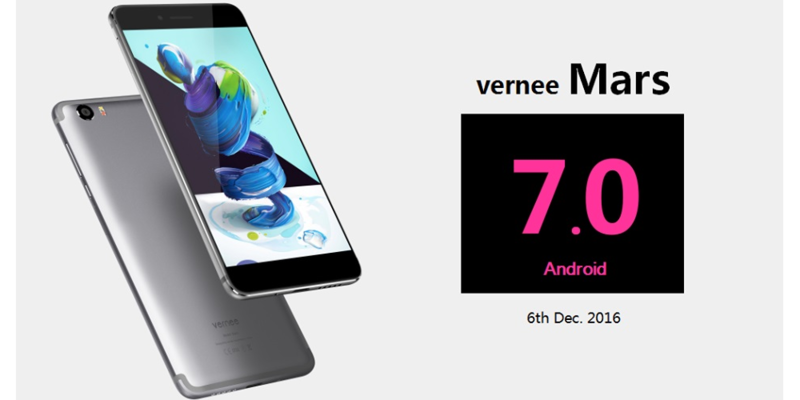 In case you do not know the specs of this smartphone, Vernee Mars has a 5.5 inch panel with a resolution of 1080 x 1920 pixels and a density of 401 dpi (pixels per inch). It is a device powered by a 4x 2.0 GHz ARM Cortex-A53, 4x 1.0 GHz ARM Cortex-A53 chipset with a 2.0 GHz octa-core CPU and an ARM Mali-T860 MP2 GPU, and supported by 4 GB RAM and 32 GB eMMC 5.0 of internal storage. The 12.98-megapixel rear camera and 4.92-megapixel front camera provided good performance with the Android 6.0 Marshmallow operating system, so it is expected to stay with Android Nougat. The 3000 mAh battery manages very well to maintain the maximum battery life possible (also thanks to the functions of Doze).